The Ring Of Trust is the brainchild of Whip Basics founder and my friend, Robby Amper. 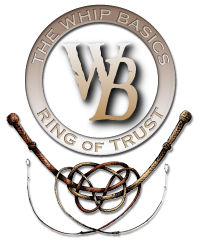 The Whip Basics Ring of Trust seal signifies membership in a small group of like-minded whip makers who are committed to the highest level of professional integrity, craftsmanship and customer service. We are so committed to these ideals that we are willing to back up the work of our fellow members. Below the fellow founding members. So, I feel quite confident that there will never be a necessity to intervene on a customer’s behalf because these are some of the finest whipmakers in the world, each with a sterling reputation for quality and service.